Personally I find this book is full of cliches and so repetitive, however, I have to give these books a lot of credit because they really do draw the attention of children and after all if we're trying to get children to read. 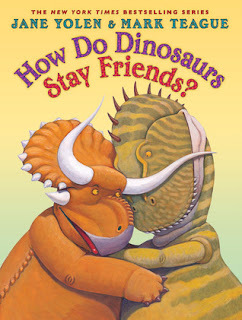 When picking a book for the children’s reading group, you want to read a book that they really want to look at and you know children love dinosaurs. As such, even though I'm not a huge fan, as long as the children in the reading group love these, I will continue to read them. So, I have to say this one gets a good score.